Our law office was built in 1970 as an office building of the attorneys' cooperative according to the then rules of law. In the 1970s there were 8 attorneys in this attorneys' cooperative. 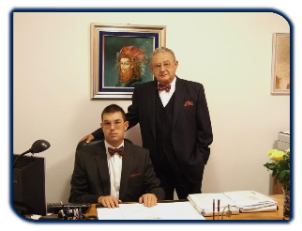 From 1975 to its termination in 1991 Dr. Csaba Pataky was the head of the Attorneys' Cooperative of Törökszentmiklós. In 1991 the property of attorneys was privatized and then Dr. Csaba Pataky purchased the portion of the Bar from this real estate so now this is our own property. In 2002 we had the building renovated fully, we have completely and exactingly furnished it with first rate office furniture and original paintings. Under these original circumstances we are entirely at our domestic and foreign clients' disposal. 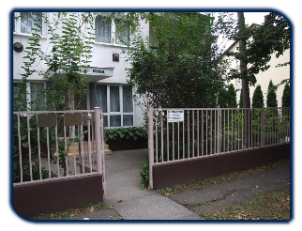 Our office is situated in a frequented and undisturbed place of Törökszentmiklós, in the vicinity of the main roads, railway station and bus station. The place is suitable for absorbed and undisturbed work as well as scientific activity. Our clients feel pleasantly in our law office where we ensure the most important thing, the atmosphere of calm discussion to our clients. Both of us have access to TAKARNET database which means that we are entitled to download an extract from the land register and a map section of real estate from the Internet. Both of us have electronic signature which is among others necessary for the registration procedures of companies and other business associations as well as for order for payment procedures.